It’s Monday, the beginning of a new week. It signals a return to work for most, while some go back to school, or are maybe heading for a nice well deserved vacation. One thing’s for sure, there will always be someone who’ll ask “How was your weekend?”, and you’ll go on with your story of what you did, or where you went. As for me, I went and watched a movie on Friday night with a few friends and ended up at Hoops Sports Bar & Grill in Mississauga, a franchise bar with a few locations around Sourhern Ontario to watch some soccer. Saturday, I was back with those same friends at the same bar for more food, drinks, and sports. 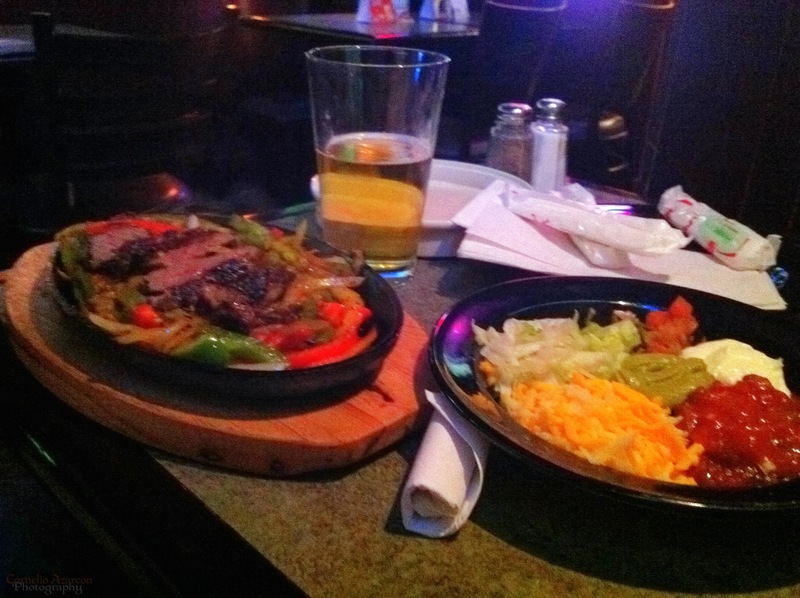 Fridays are fajita nights at Hoops, so one of my friends ordered a steak fajita. It smelled good, especially with all the sautéed vegetables and steak cooked in a cast iron skillet and served sizzling hot right in front of you. It comes with tortilla wraps, salsa, lettuce, cheese, and guacamole. 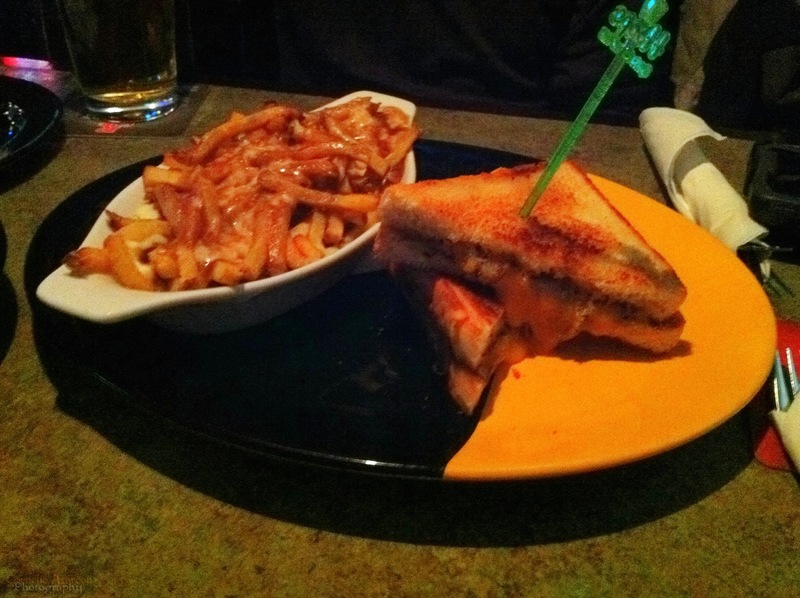 My other friend ordered the grilled cheese sandwich with a side of poutine. It looked good, but for the sandwich and a side of fries or salad at $7.49, and $1.49 extra for bacon, or more to upgrade your fries to a poutine, it sounded a little too pricey for something so simple. 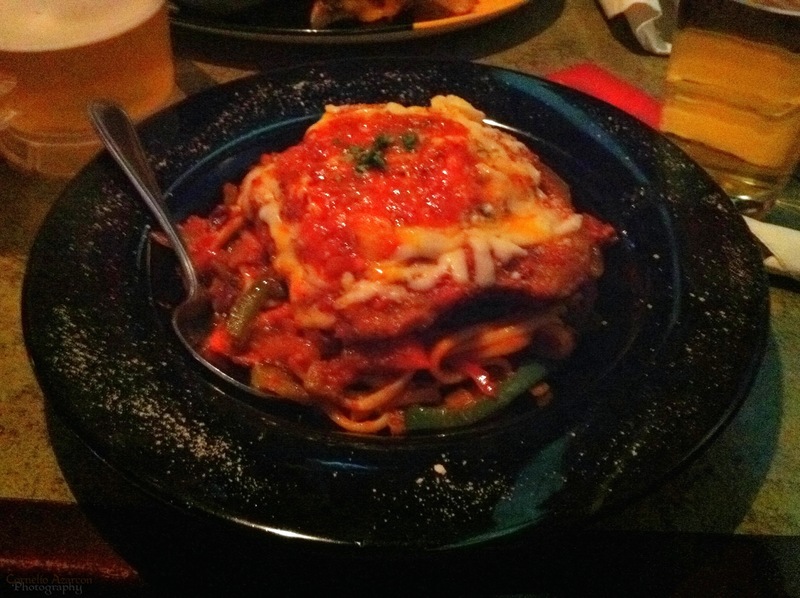 I ended up ordering the Sicilian Connection, which was spaghetti with their homemade meat sauce served with breaded veal on top. The meal was delicious, with the veal being tender and the breading crispy, it was the highlight of the dish. The meal was a little less than $20.00 and was worth it. For dessert, I ordered the Blackout Torte, a dark chocolate cake that was very moist and chocolatey. 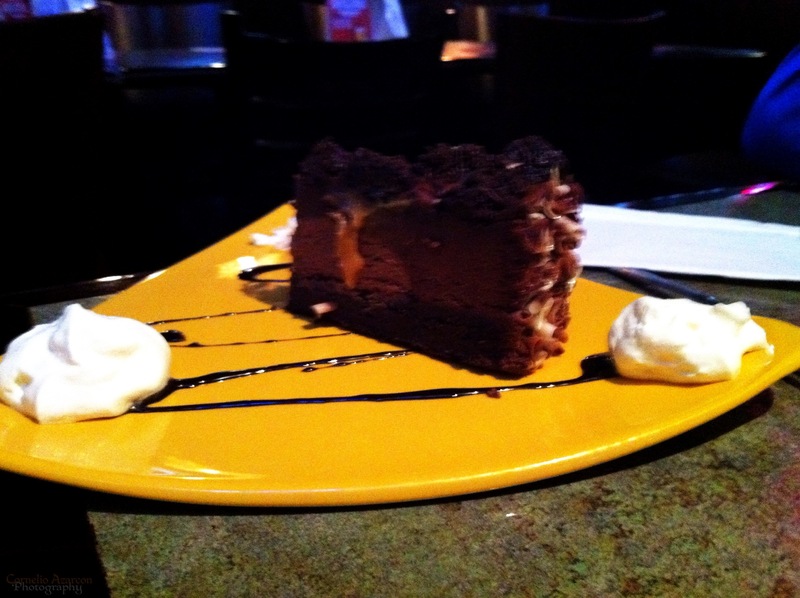 A great end to a meal for a chocolate lover. On Saturday night, one of my friends ordered the cheese pizza, sorry no pictures, but I wasn’t too impressed with it. It tasted ok, but not a dish you’d visit the establishment for. My other friend and I both got the special for the night, which was the pint & pound. I ordered the Cajun wings with a side of fries. 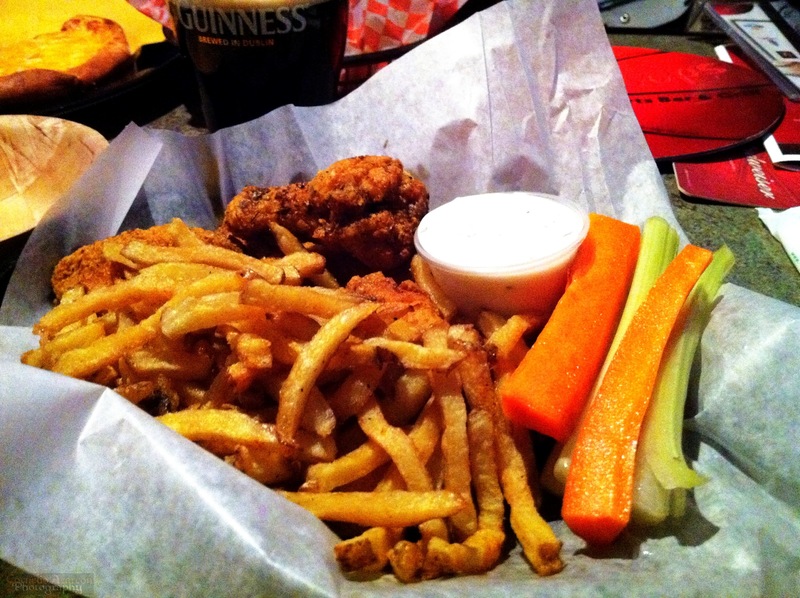 The wings were lightly dusted with Cajun spices, and were well cooked. The wings were not the best I’ve had by far, but not bad either. I would order them again, but would choose the side salad instead of fries. The fries were greasy and soggy, which was a disappointment. There was no crispness to it that you would expect fries to have. This time, for dessert, I ordered the Mango Berry Cheesecake. It was nice and refreshing, and a great pallet cleanser. Overall, the meals during those two nights were average. Good atmosphere for a sports bar, but the quality of the food needs improvement, especially to warrant its prices. Ah yes….good old sporting grub. Never a bad thing. You mentioning poutine though hit my craving button. Damn! 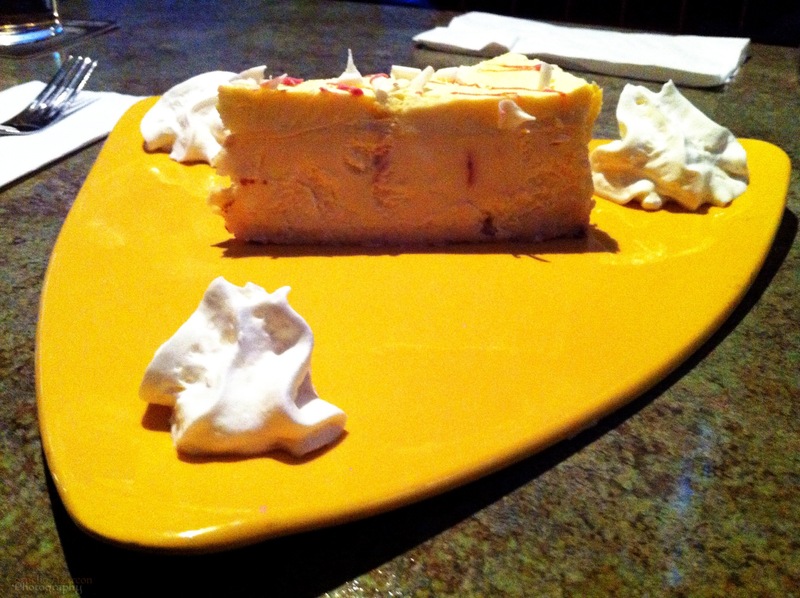 The Mango Berry Cheesecake is out of this world at the Bremner location by the Rogers Centre.